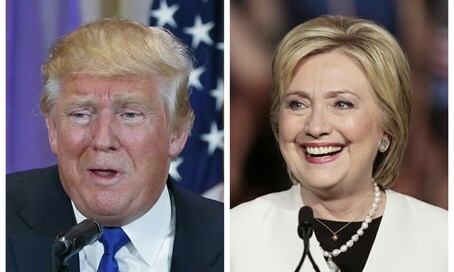 MainAll NewsUS & CanadaDo Israelis prefer Trump or Clinton? Do Israelis prefer Trump or Clinton? As presidential election heats up, what do Israelis think of the two candidates? Who do they prefer - and who will be better for Israel? With the Republican and Democratic national conventions just weeks away, the US presidential general election season has begun in earnest, with the first attack ads playing in battleground states across the country. Now that both parties have effectively determined their respective candidates, what do Israelis think of the election? Who do they believe would be better for Israel, and who would they vote for if they had American citizenship? According to a poll conducted by Midgam and publicized on Channel 2 Wednesday evening, Israelis have mixed feelings about both candidates, believing that Trump would generally be more receptive to Israel’s needs – but that Clinton is more qualified to govern. By a fairly wide margin, Israelis believe Trump would have a better relationship with incumbent Israeli Prime Minister Binyamin Netanyahu than would Clinton, with 43% saying Trump would get along better with the Israeli leader, versus 34% who said Clinton would have a better relationship. Regarding who would be more likely to pressure Israel into accepting a final status agreement, the results were even more lopsided, with 57% of respondents saying Clinton was more likely to force Israel into an agreement, compared to 13% who said Trump was more likely to do so. When asked which candidate, as a whole, would be better for Israel, Trump won, but only by a single point, 37% to 36%. Despite the perception that Trump would be more amicable to Israel and its leadership, when asked whom they would vote for if they were able to participate in the election, Israelis favored the former Secretary of State by 7 points, 42% to 35%. Overwhelmingly Israelis believe that Clinton is more suited to govern as president by a margin of 47% to 31%.